SOFIA, BULGARIA — On Orthodox Easter, one of the most sacred holidays for Christians here, Macedonians mourned the deaths of five Macedonian men amid speculation that their killers were ethnic Albanians, arousing fears of a new bout of intercommunal violence. The men were fishermen, four were in their late teens or 20s and one was 40; they were found dead Thursday night on the shore of an artificial lake near the village of Smiljkovci outside the capital, Skopje. They were buried on Saturday. 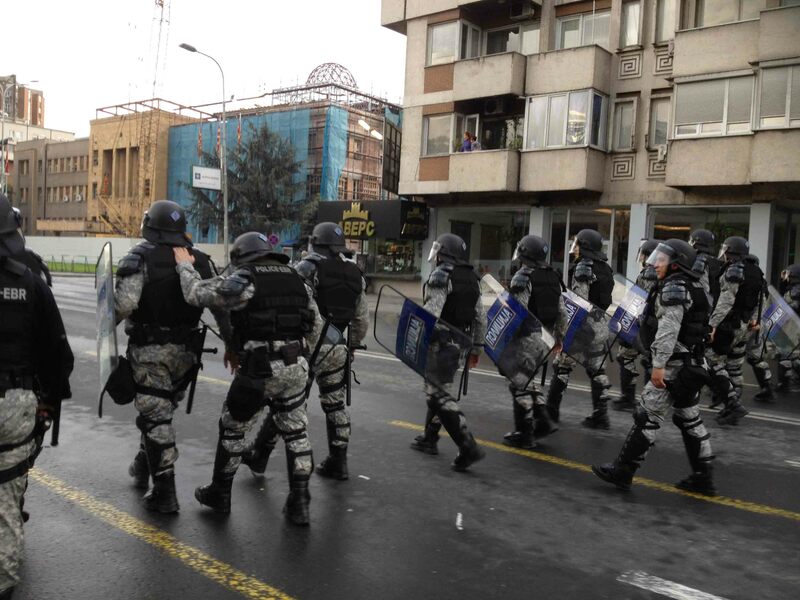 Macedonia was tense Sunday as police officers searched for the killers and possible motives. While no evidence links the killings to ethnic tensions or to two episodes of ethnic violence this year, the riot police were deployed on Friday as angry protesters blocked a road, broke the windows of a TV channel’s vehicle and threw rocks at passing buses. Interior Minister Gordana Jankulovska said Saturday that ballistic experts had found that three types of firearms had been used — implying multiple killers — and that the victims had no criminal records. Officials from the Organization for Security and Cooperation in Europe, the U.S. Embassy in Skopje and President Gjorge Ivanov appealed for calm and also cautioned against speculation about the ethnicity of the killers. The latest incident came a month after an off-duty Macedonian policeman killed two ethnic Albanians in a dispute over a parking space in the city of Gostivar. Those killings set off several days of rioting and street fights between youths with iron bars, clubs and knives, resulting in dozens of injuries. A court has still not ruled whether the Gostivar killings were connected to the men’s ethnicity. About one-quarter of Macedonia’s population is Albanian, and most of them are Muslims. Ethnic Albanian rebels waged an eight-month armed insurgency in 2001 for increased autonomy in which some 80 people died. A peace agreement, brokered by international envoys in the southwestern city of Ohrid, ended the 2001 conflict. While the agreement encouraged Albanians to integrate politically, a societal chasm remains. “The ethnic communities live more separated than ever,” said Biljana Vankovska, a political scientist at Skopje University. “Ohrid institutionalized ethnicity to such a degree that there is no room left for any integration or common action among groups,” she said. The Ohrid agreement brought about the decentralization of power in the Balkan state of two million, with some municipalities reorganized along ethnic lines. Even though the incident comes shortly before the NATO summit meeting in Chicago on May 20, analysts said there probably won’t be any impact because Macedonia is unlikely to be invited to join the alliance. Macedonia’s inclusion in NATO has been vetoed by Greece, which rejects the use of the name Macedonia. Greece says the use of the term implies a claim to Greek territory with the same name. Athens has also blocked an invitation to Macedonia to begin talks to join the European Union. For many ethnic Albanian citizens of Macedonia, much of the autonomy and integration promised under the Ohrid accord has yet to be realized. Many say that the ethnic Macedonian-dominated government never recognized the need for increased language rights and autonomy for minority communities and complain that it formally respects the Ohrid process without showing the political will to implement it effectively. “For these 10 years, the government has only been pretending that it’s trying to integrate minority groups,” said Bekim Kadriu, an international human rights law professor at the South East European University in Tetovo, 40 kilometers, or 25 miles, north of Skopje. “But at the same time, it obstructs the process” Mr. Kadriu said.